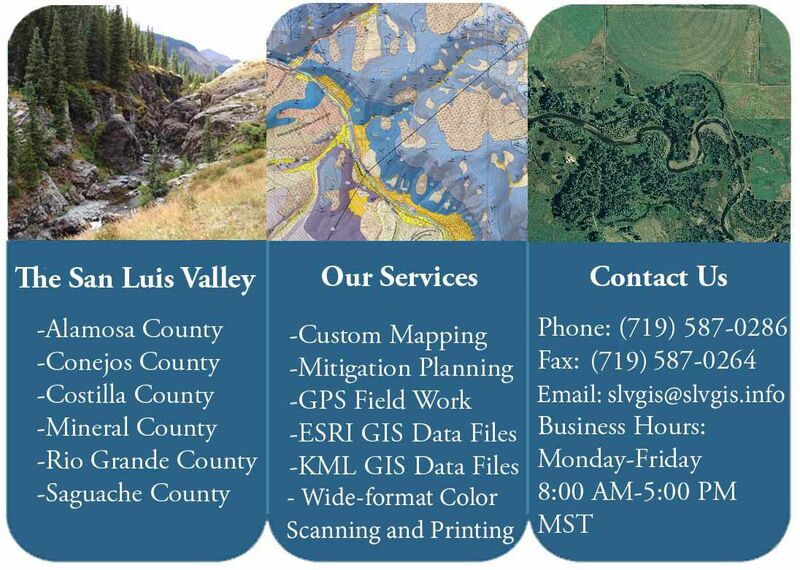 The San Luis Valley GIS/GPS Authority (SLV GIS) is a regional self-sustaining government entity. The San Luis Valley GIS/GPS Authority (SLV GIS) is a regional agency tasked with the design, development, implementation and maintenance of GIS/GPS (Geographic Information Systems/Global Positioning Systems) services and products for the positive development of the San Luis Valley. We were created by the collective county commissioners from the six member counties created SLV GIS in 1997 under Colorado Revised Statutes ¤ 29-1-203. SLV GIS is not a taxing entity; rather it has been designed to be a self-sustaining government enterprise. In essence, SLV GIS enhances local governments, private businesses, non-profit groups, federal and state agencies and individual citizens through the provision of seamless, standardized GIS coverages across this 8,000+ square mile region. Our research indicates that we are the only regional GIS Authority that is NOT tax-based within the entire USA.